An ornate, wooden Counter Table and Bar Stool set. These models, seperately or together, can easily provide a classic/modernist look and feel to your arch/viz interior renders, or it could also work very nicely as character props. 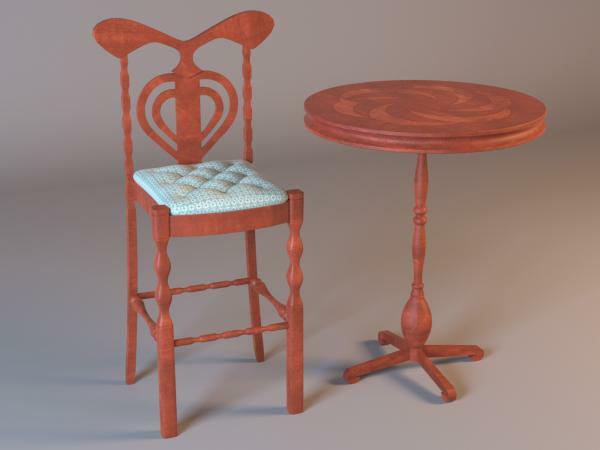 These models are available as a native 3dsmax 2012 scene file (.max), and also in several scaled .obj formats, for importing easily into other applications, like Blender, Poser, or Daz|Studio. They come complete with high res COLOR and BUMP texture maps, where needed. All textures are .jpg format, and sized to a resolution of 2048x2048; suitable for high quality, close-up rendering. The topology is cleanly modeled from 100% quadrilateral polygons (Quads), with a detailed, but optimized poly count of just 27,978 total polygons (20,346 for chair and 7,632 for table), and 28,093 verts. DarwinsMishap (5 years ago) Inappropriate? Mme Rosa (6 years ago) Inappropriate? Thank you very much, a very nice set. Many thanks - looking good! Thank you. These look very good. I'm please you when to the trouble of exporting in .obj format for those of use who don't have 3DS Max. it looks very nice, thank you so much !